Sweet potato is one of the many false expectations I had before coming to Colombia. I had thought it would be abundant in the land of potatoes. According to the International Potato Centre (yea.. It exists..), ‘there are 4,000 varieties of potatoes in the Andean countries’, i.e. Peru, Bolivia and Ecuador. I would think Colombia is ‘half Andean’, if not ‘fully Andean’, and being a neighbour of these countries, even if we are deemed not Andean at all, I would think we would still get lots imported. I guess I misconstrued South America as Europe, thinking that there would be lots of trades and cultural exchange here.. Wrong. Actually while sweet potato is a basic find at all supermarkets in England, it is unseen here. I blame it on Colombians’ taste and preference, which tends to be sweet-averse. They eat 2 types of potatoes here. Criolla (yellow, small) and sabanera (waxier, hard, reddish skin). 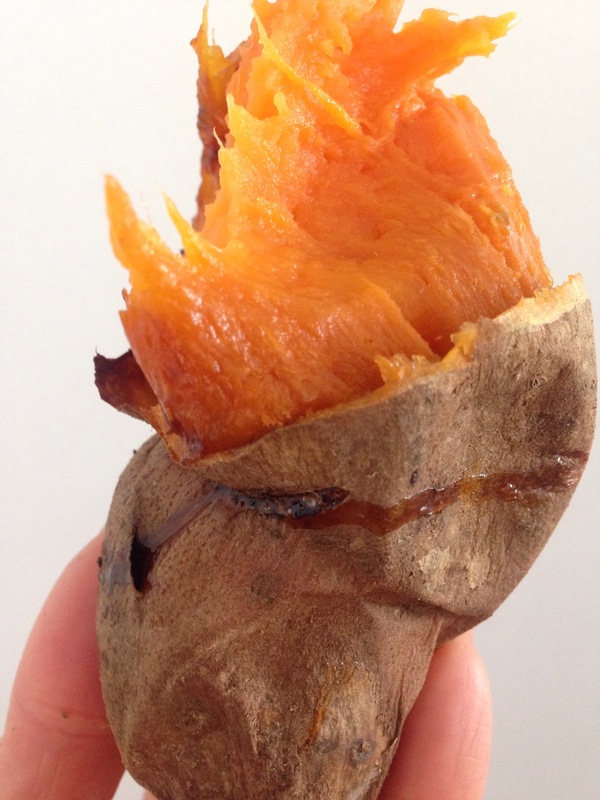 The first time I encountered sweet potatoes was in Lima, where it was everywhere – sweet potato chips (for breakfast!) and bags of sweet potato crisps. So, when I recently came across the sweet orange variety in Paloquemao, I went wild. Ask for the stall Donde Peter! Thanks Maria! Thank you for the tip! Yes another common potato here is papa pastusa! Thanks for your support! Keep reading!